Adventure clearly figures in the shared DNA of cousins Billie Olson and Carol Stalp, who grew up across the street from each other in Harrisburg, a town of only 3,567 people, 25 minutes north of Eugene. After graduation in 1969, Olson, from the University of Oregon, and Stalp, from the University of Portland, moved across country to the White Plains area of New York, where they both earned master’s degrees. The two enjoyed lifelong careers in education. Olson taught high school; Stalp, grade school. Returning to Oregon was never considered until retirement in 2000. When Stalp abruptly purchased a condo in Beaverton while on vacation visiting her sister in 2011, Olson arrived a few days later and was told, “Now, it’s your turn!” She sold her Nantucket house and also returned to her home state. This is where the adventure of the Wine Cousins began. Having never participated in an official wine tasting, they were advised by Stalp’s sister to watch the OPB documentary “Oregon Wine: Grapes of Place,” featuring the founders of the state’s industry. Afterward, they walked to the local wine shop, bought a bottle of Domaine Drouhin, some cheese and crackers, and delved into the movie a second time. During the second viewing, they looked at each other and said, “Ponzi? We’ve seen the blue signs near Al’s Garden Center. Let’s go!” Knowing nothing about tasting protocols or expectations, the cousins were greeted by a knowledgeable staffer who impressed them with gracious hospitality. The two were hooked. The same day, Sept. 19, 2014, Olson and Stalp visited Ponzi’s newer tasting room near Sherwood. They immediately made plans to visit all the other founders’ wineries, including The Eyrie Vineyards, Adelsheim, HillCrest, Erath, Oak Knoll, Elk Cove, Amity Vineyards and others. While at Ponzi, the cousins noticed a bottle set off to the side, not on the menu. They inquired about it and were told it cost $100. Wanting to taste the wine, they encouraged four other customers in the tasting room to go in on it. The goal of the adventure quickly morphed, however, to experiencing all the wineries around the state. I was pouring at Vitis Ridge in Silverton when I met Olson and Stalp in November of 2017. 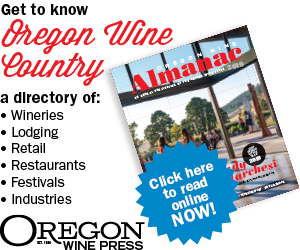 They were so excited to share how we were the 380th Oregon winery they had visited. 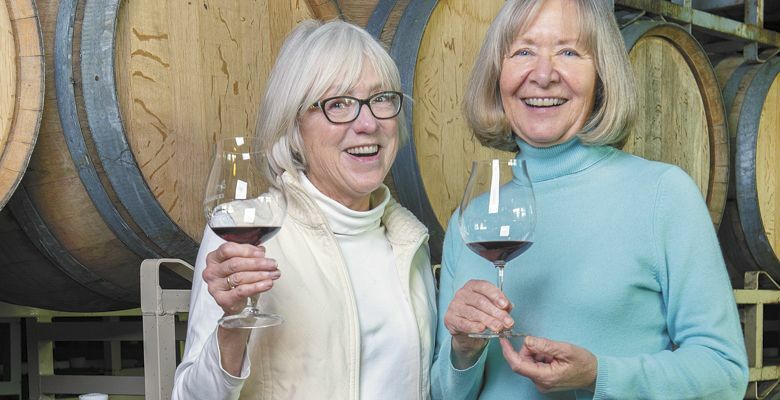 These exuberant women are outgoing and gregarious, chatting with everyone in the room, and especially interested to hear all about the wine and the story behind the vineyard. Their energy is infectious. So much so I asked if could join them. The location? EIEIO Wines just outside Carlton, the cousins’ 419th winery. We chatted with winemaker Jay McDonald, tasted some fun wines and spent the morning surrounded by the lush green rolling hills surrounding the tiny winery. Like true educators, Olson and Stalp take notes about each experience, helping remind themselves of where they’ve been and whether to return. They are, of course, evaluating and ranking the wine but also the tasting room, the view and the staff, ultimately giving the winery and experience an overall score on a scale of one to five. So, how do the wineries rank? Well, the quality of the wine has to be good. A place could have the best views and a beautiful tasting room, and the staff could be really friendly, but if they’re pouring inferior wine, they’re not likely to score well. However, even if the wine tastes outstanding, but the experience isn’t pleasant, either because the space is dirty or the staff ignores guests, the score really suffers. They make efforts to revisit if they were initially disappointed, but, so far, their first impressions have remained intact. Yet even with all their discerning taste, a warm greeting goes a long way and seeing a beautiful old oak tree in a field outside the tasting room can make for a fantastic view. One favorite spot remains Garnier Vineyards in the Columbia Gorge. If you ask them for their top five, they can’t seem to limit themselves … Dusky Goose, Tendril, Domain Drouhin, Owen Roe, Blizzard, Fairsing, Angela Estate, Le Cadeau and Chris James all were named, and they would have kept going. It’s much easier for the cousins to narrow down general advice to wine tourists instead of choosing their best experiences. On tasting, they offer: “Let them know you’re new, be excited and once you do one, you’ll see just what the fuss is all about.” Specifically, they suggest traveling Worden Hill Road in the Dundee Hills as the perfect starting point — beautiful wineries, great wine and some really outstanding experiences at each one. For the Wine Cousins, what makes the Oregon experience so unique is how winemakers can still be present on site and often available for chatting. While they understand the industry continues to grow, they hope brands value the personal touch on which the industry was founded. They are seeing tasting rooms that are more impressive, elegant, expensive but, unfortunately, more impersonal. Olson and Stalp don’t have any plans to share their extensive notes or their rankings; they are simply happy to get the chance to do it. Their experiences can inspire us all to create our own adventures in Oregon, with wine leading the way. The next adventure for the Wine Cousins should take them south to Medford and Ashland. The trip will get them somewhat closer to their goal of visiting all the wineries. As a side note, they would really like to meet Christophe Baron from Cayuse Vineyards in Walla Walla. But, since the winery isn’t in Oregon, plans to visit will have to wait. For now, it’s totally Oregon or bust.